Kiborus Fabius of Farland became a vampire in the year 7260 F.R. He was a warrior-priest of Heshtail in the Far City, but he secretly harbored dark desires in his heart. The Walker knew this and decided to test him to see if he would make a good servant, for the Walker revels in corrupting the holy: he sent a spirit to possess him and the spirit made Kiborus abduct and murder a young girl. Although he was under the evil spirit's control, in his heart of hearts Kiborus enjoyed the deed. Thus he proved to Vornoth that he would be a worthy vassal. The Dark Walker sent an ancient Vampire known only as Crimson to visit him. After years of servitude, Kiborus slew his creator and found service with The Dweller in the Vale. This Dark Ruler sent him to Daven to recruit The Lord of Gluttony. He slew the then-king of Daven, Dakor V. He later made Saithith the Lord of Gluttony. After instructing Saithith about his new undeath state and how to be a successful vampire, Kiborus left. Finally, at the behest of the Dweller herself, the eminent vampire took up residence as the Chancellor of the Nameless City. Lord Kiborus is an average-looking man with a gleaming bald head. He has pale, shiny skin, but can easily pass for human in less than perfect lighting. His eyes are remarkable, however; they are violet in color and sparkle with a horrible silver light. He rarely shows the fangs that pass for his canines. Kiborus dresses in rich black garb made of velvet, cut in a timeless style, and he wears a diamond at his throat. At first glance, this combination puts one in mind of a priest. The former warrior-priest of Heshtail (now a priest of Vornoth) is very polished and mannerly in his speaking, but he has a fiery temper and is quick to anger. When he flies into a rage, he is murderous. As Chancellor of the Nameless City, Kiborus is efficient and ruthless. While he has the compulsion of all vampires-- to feed-- his strongwill power gives him the ability to control his urges. In fact, as Chancellor, Kiborus has no shortage of orcs and other hapless creatures upon which to feed, and he never has to fear for his next meal; thus he can spend his energy and time running the city and carrying out the orders of the Dweller in her hideous tower of ice. Those orders are few and far between, though, for her purposes are inscrutable, and she leaves the management of her capital to the vampire priest. After all, he has been running it successfully for centuries. Shapechanger. If Kiborus isn't in sun light or running water, he can use his action to polymorph into a Tiny bat or a Medium cloud of mist, or back into his true form. While in bat form, he can't speak, his walking speed is 5 feet, and he has a flying speed of 30 feet. His statistics, other than his size and speed, are unchanged. Anything he is wearing transforms with him, but nothing he is carrying does. He reverts to his true form if he dies. While in mist form, Kiborus can't take any actions, speak, or manipulate objects. He is weightless, has a flying speed of 20 feet, can hover, and can enter a hostile creature's space and stop there. In addition, if air can pass through a space, the mist can do so without squeezing, and he can't pass through water. He has advantage on Strength, Dexterity, and Constitution saving throws, and he is immune to all nonmagical damage, except the damage he takes from sunlight. Legendary Resistance (3/Day). If Kiborus fails a saving throw, he can choose to succeed instead. Misty Escape. When he drops to 0 hit points outside his resting place, Kiborus transforms into a cloud of mist (as in the Shapechanger trait) instead of falling unconscious, provided that he isn't in sunlight or running water. If he can't transform, he is destroyed. 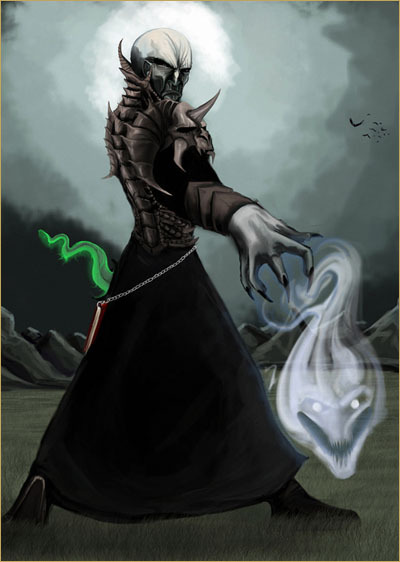 While he has 0 hit points in mist form, he can't revert to his vampire form, and he must reach his resting place within 2 hours or be destroyed. Once in his resting place, he reverts to his vampire form. He is then paralyzed until he regains at least 1 hit point. After spending 1 hour in his resting place with 0 hit points, he regains 1 hit point. Regeneration. Kiborus regains 20 hit points at the start of his turn if he has at least 1 hit point and isn't in sunlight or running water. If Kiborus takes radiant damage or damage from holy water, this trait doesn't function at the start of his next turn. Spider Climb. Kiborus can climb difficult surfaces, including upside down on ceilings, without needing to make an ability check. Forbiddance. Kiborus can't enter a residence without an invitation from one of the occupants. Harmed by Running Water. Kiborus takes 20 acid damage if he ends his turn in running water. Stake to the Heart. If a piercing weapon made of wood is driven into Kiborus's heart while Kiborus is incapacitated in his resting place, Kiborus is paralyzed until the stake is removed. Sunlight Hypersensitivity. Kiborus takes 20 radiant damage when he starts his turn in sunlight. While in sunlight, he has disadvantage on attack rolls and ability checks. Multiattack (Vampire Form Only). Kiborus makes two attacks, only one of which can be a bite attack. Unarmed Strike (Vampire Form Only). Melee Weapon Attack: +9 to hit, reach 5 ft., one creature. Hit: 8 (1d8 + 4) bludgeoning damage plus 3(1d6) cold damage. Instead of dealing damage, Kiborus can grapple the target (escape DC 18). Bite (Bat or Vampire Form Only). Melee Weapon Attack: +9 to hit, reach 5 ft., one willing creature, or a creature that is grappled by Kiborus, incapacitated, or restrained. Hit: (1d6 + 4) piercing damage plus (3d6) necrotic damage. The target's hit point maximum is reduced by an amount equal to the necrotic damage taken, and Kiborus regains hit points equal to that amount. The reduction lasts until the target finishes a long rest. The target dies if this effect reduces his hit point maximum to 0. A humanoid slain in this way and then buried in the ground rises the following night as a vampire spawn under Kiborus's control. Charm. Kiborus targets one humanoid he can see within 30 ft. of him. If the target can see Kiborus, the target must succeed on a DC 17 Wisdom saving throw against this magic or be charmed by Kiborus. The charmed target regards Kiborus as a trusted friend to be heeded and protected. Although the target isn't under Kiborus' control, he takes Kiborus' requests or actions in the most favorable way he can, and he is a willing target for Kiborus' bit attack. Each time Kiborus or his companions do anything harmful to the target, he can repeat the saving throw, ending the effect on itself on a success. Otherwise, the effect lasts 24 hours or until Kiborus is destroyed, is on a different plane of existence than the target, or takes a bonus action to end the effect. Kiborus can take 3 legendary actions, choosing from the options below. Only one legendary action option can be used at a time and only at the end of another creature’s turn. He regains spent legendary actions at the start of his turn. Move. Kiborus moves up to his speed without provoking opportunity attacks. Unarmed Strike. Kiborus makes one unarmed strike. Bite (Costs 2 Actions). Kiborus makes one bite attack. The Cold Master is usually found in his stronghold in his Iron Citadel in the Nameless City. Only ghosts and other undead haunt the area around his lair, but if someone spends time within the inner part of the Nameless City, he will be haunted by nightmares about undeath and will gain a craving for raw meat. If he is in his lair, Kiborus has a challenge rating of 17 (15,000 xps). On initiative count 20 (losing initiative ties), Kiborus can take a lair action to cause one of the following effects. Kiborus can't use the same effect two rounds in a row. Kiborus casts wall of ice. He does not have to maintain concentration on this spell; instead it lasts until he uses another lair action. The victims of the Cold Master appear as barely substantial shades all around him, reaching out for the living. That area is difficult terrain for all but undead until initiative count 20 in the next round. A piercing and heart-wrenching scream, from one of the Cold Master’s victims, blasts out. Any enemy within 60 feet of Kiborus must make an immediate DC 17 saving throw to maintain concentration on any spells; failure means concentration is lost. When a creature successfully saves against this effect, it can’t be affected by it again until 24 hours has passed.